This week we are going to explain a little more about how Invisalign works. 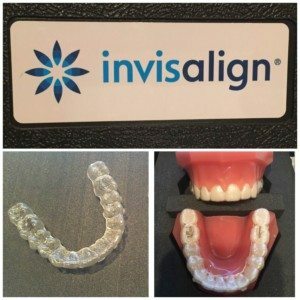 Many of you may already know that Invisalign is an alternative to traditional braces and brackets, but how do you get from crooked to straight? Invisalign makes a set of clear retainers that change tray to tray. Each tray gets you one step closer to straight teeth! When using in combination with Propel, each tray is only worn for 3 days! Treatment with Invisalign and Propel is typically only 1-6 month(s) long. Before we introduced Propel, treatment was anywhere from 3 months- 3 years! In this step, we take a digital scan of your teeth and send it to Invisalign. From here, they coordinate a plan of how they want the teeth to move. They will send us a “ClinCheck” video plan showing what each aligner will do to gradually move the teeth. Dr. Emery reviews the ClinCheck for any changes or approves the case. Invisalign makes the appropriate number of aligners per each patient. The number of aligners vary from five to over fifty depending on how much movement is needed. 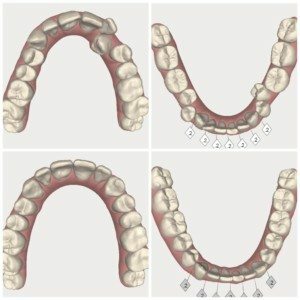 Five trays is typical of anyone who had orthodontics in the past and has had slight shifting. A full case is for a patient who needs significant movement and several aligners to transform their smile. The photo below shows a patient of ours who is about to start treatment. This is the digital “ClinCheck” Invisalign sends us. Look at the amazing results! Invisalign Clin-Check before (top) and after (bottom)! For the start of Invisalign, we usually place attachments on the teeth that need help with movement or rotation. They can barely be seen and are tooth-colored so they are less noticeable. We then will give you a starter goodie bag with cases for the aligners, cleaning crystals and an acrylic brush to clean them. If the Propel treatment is used, we usually deliver 4-7 aligners at a time. We then schedule a time to have you back to deliver your next set of aligners and make sure you are on track with treatment. At the end of treatment, it is very important to stay in a retainer or night guard so the teeth do not shift. Relapse will happen if there is nothing holding the teeth in place. We can have clear retainers made to be worn at night or place a lingual bar on the back part of the teeth to hold the teeth in place. A full arch night guard can also be made to hold the teeth straight and help with any clenching or grinding. That is it, a very easy (and now speedy) process! We hope this helps breakdown treatment to any patient that is interested in Invisalign and wanting the amazing benefits of the treatment!